Alexis de Tocqueville arrived in America on May 10, 1831. He departed on February 20, 1832. He spent 271 days in the United States; 15 others were spent in Canada. Then, over the next several years, he wrote one of the most perceptive interpretations of American life ever written, Democracy in America. Tocqueville touched on almost every conceivable facet of American life with a view to understanding the character of American democracy which was still something of a novelty, and certainly not guaranteed to endure. He necessarily generalized from his limited experience, but he did so brilliantly. Reading Democracy in America today, one is left with the impression that he saw through to the soul of the young republic and many of his observations remain compelling. The tenth chapter of the second volume (Democracy in America was a hefty work) is titled “Why The Americans Are More Addicted To Practical Than To Theoretical Science.” You may recall from the essays of Leo Marx on the emergence of the concept of technology, that in Tocqueville’s day technology had not yet taken on the multifaceted sematic role it serves today. Other words and phrases, such as practical science, were invoked to discuss the various realities that we would group under technology. In this chapter, then, we find Tocqueville turning his attention to the American fascination and facility with technology. 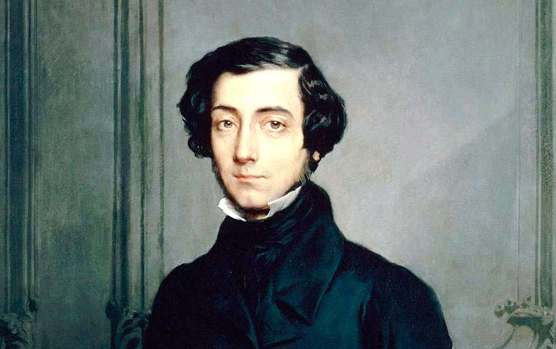 As with all of the particularities of American society that Tocqueville discusses, he is mostly concerned to understand the consequences of the democratic political culture on the topic under consideration. At the outset of this chapter, for example, he notes that, “Equality begets in man the desire of judging of everything for himself: it gives him, in all things, a taste for the tangible and the real, a contempt for tradition and for forms.” And so it is with the culture of American science and technology. Moreover, Tocqueville adds, “A desire to utilize knowledge is one thing; the pure desire to know is another.” Americans are decidedly in the former camp. Put otherwise, all of this means that America is much more likely to produce a Thomas Edison than an Albert Einstein. As a generalization, this seems about right still. I’m hard pressed to name theoreticians that Americans presently hold in high regard. Perhaps Stephen Hawking, but then again, he is not American. We venerate the likes of Steve Jobs and Bill Gates instead. The inventor-entrepreneur is still the preferred American icon. And that is why Tocqueville is still in print — his analysis still resonates even if we may quibble with the details. This is as succinct a diagnosis as one could hope for of the distinct blend of technology and economics that we might label America’s techno-start-up culture. What Tocqueville could not quite anticipate is the degree to which technology would eventually drive theoretical science. In this regard, his analysis falls short. But his insight into the American temperament and its stance toward technology has proved remarkably durable. One final note, given recent posts, Tocqueville’s analysis is also an argument against a hard technological determinism. The history of technology in America takes its unique shape, at least in part, due to America’s political economy. But, mindful of the reciprocal nature of technology’s relationships to society, it would be only fair to note that technology has since rather significantly reshaped America’s political economy. any idea who painted the portrait? Théodore Chassériau in 1850. I’ll add the caption.